Satisfies hunger and helps you stay full longer with organic whole food fiber. 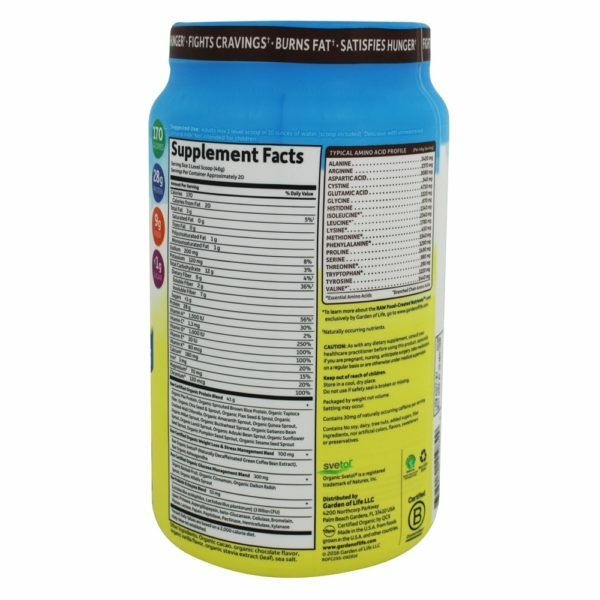 Contains easily digested plant proteins PLUS live probiotics and enzymes. Offers 28g of complete protein—13 organic sprouted grains, seeds and legumes. Contains Svetol Green Coffee Bean Extract—to burn fat naturally and maintain healthy blood sugar. Ships Priority Mail (1-3 days). Price shown reflects added cost for oversize or overweight items. Orders of 2 or more items (mix and match) get a $3 Credit for each additional item at checkout. Garden of Life Raw Organic Fit High Protein For Weight Loss Chocolate is specifically designed for weight loss and is made with 13 raw sprouted organic ingredients. It differs from their other proteins because it has several additional clinically studied ingredients, including Svetol Green Coffee Bean Extract, Raw Food Created Chromium and Organic Cinnamon to help you burn fat, maintain healthy blood sugar, boost your energy, lose weight and look great! Adults mix 1 level scoop in 10 ounces of water up to 2 times per day (scoop included). Can also be mixed with unsweetened almond or rice milk. Not intended for children. As with any dietary supplement, consumer healthcare practitioner before using this product, especially if you are pregnant, nursing, anticipate surgery, take medication on a regular basis or otherwise under medical supervision. Keep out of reach of children. Store in a cool dry place. Do not use if safety seal is broken or missing. 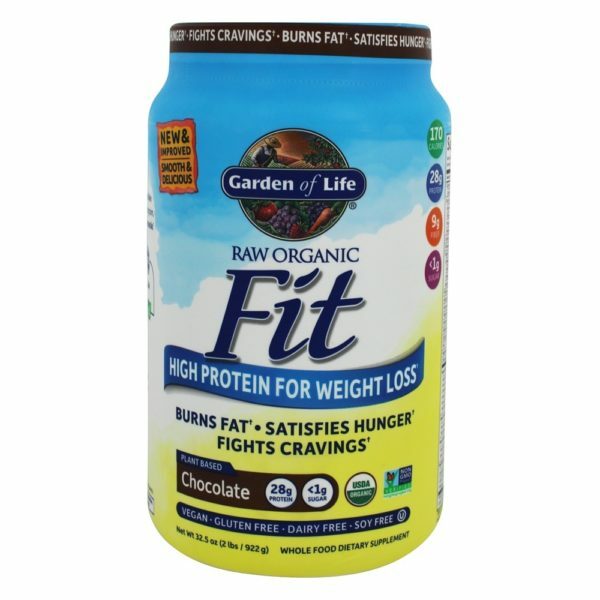 Garden of Life - Raw Organic Fit High Protein For Weight Loss Chocolate - 32.5 oz. Organic Pea Protein, OrganicSprouted Brown Rice Protein, Organic Tapioca Fiber, Organic Chia Seed & Sprout, Organi Flax Seed & Sprout, Organic Cracked-Wall Chlorella, Organic Amaranth Sprout, Organic Quinoa Sprout, Organic Organic Millet Sprout, Organic Buckwheat Sprout, Organic Garbanzo Bean Sprout, Organic Lentil Sprout, Organic, Adzuki Bean Sprout, Organic Sunflower Seed Sprout, Organic Pumpkin Seed Sprout, Organic Sesame Seed Sprout. 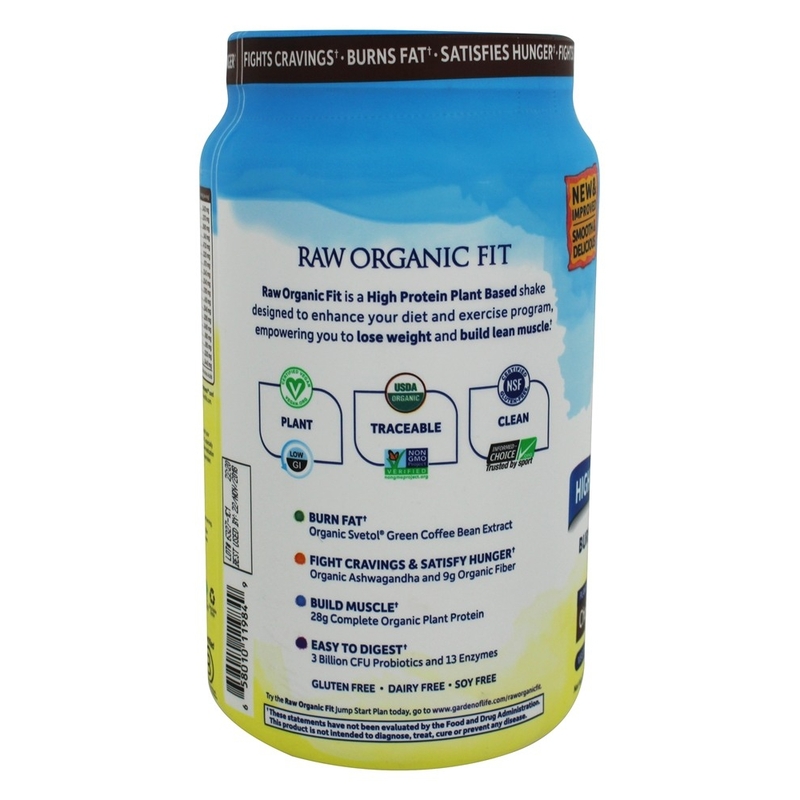 Raw Organic Sevetol (Naturally Decaffeinated Green Coffee Bean Extract), Raw Organic Ashwagandha.